PHOENIX – Eastern cultures have practiced the art of meditation for centuries. But its popularity has spread to the West in recent decades. The CEO of Phoenix-based Current Meditation wants to capitalize on that trend by taking his business and making it into a national franchise. Current Meditation plans to open as many as 175 locations nationwide in the next three years to meet a “pent-up demand for approachable meditation,” according to a news release. The company has awarded its first developer license in New Jersey. The meditation and mindfulness sector is now a billion-dollar industry, according to Fortune magazine. And a recent American Psychological Association survey indicated Americans are more stressed out than ever. The association has measured stress levels since 2006, and triggers have routinely included concerns about the economy, mass shootings and terrorism. But a recent update to the group’s “Stress in America” survey showed stress levels spiked after the 2016 presidential election. Of the more than 1,000 people surveyed in the January update, more than half of Americans said the current political climate is a very or somewhat significant source of stress. Meditation may offer an alternative way to cope with that stress. The Current Meditation in the Arcadia neighborhood in Phoenix is modern and quiet, with dim lighting and neutral tones. 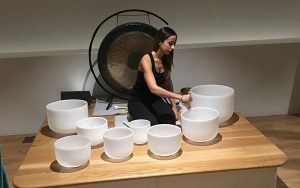 The studio has a gong and traditional meditation bowls that, when played, can help clients reach a “deeper meditative state,” according to the website. Prices range from $22 for a single session to $89 for an unlimited membership, and clients can choose from swaying in a silk hammock to focusing on breathing techniques. Margaret Beresford of South Phoenix has become a regular at Current Meditation. Beresford said she leads a seemingly nonstop and stressful life. Tired of feeling like she was constantly disconnected from the world around her, Beresford turned to meditation several years ago. “I’m using it as a way to actually reconnect with myself, center myself and be present in the moment so that I can be in the moment and connect with people in the moment,” she said. Beresford also cites positive benefits to her overall health and well-being as one of the reasons she has fallen in love with meditation. Ross Weisman, the CEO of Current Meditation, said the studio’s success in the past year is better than he could have imagined. “It’s been very exciting over the past several months. We’ve had over 13,000 people come through the studio, which has exceeded our expectation,” he said. Weisman has had experience in other franchise operations, including Massage Envy and European Wax Center, according to the release. Weisman said one of the reasons meditation is so popular is because the benefits stay with you throughout the day. Beresford said she hopes others can benefit from this growing trend as much as she has. “I’m working towards getting to the place where I feel like I would be able to have the control over my mind in a much deeper way that would allow me to live my best life,” she said.